Open : May to October ... Hersonissos Blue Hotel provides budget accommodation close to the beach and lively nightlife, just 400 metres, with it's 24hr bars. As part of the same unit as the studios the Hersoonissos Blue you share the same fantastic location in the lively centre of Hersonissos. You'll also have all the same facilities such as the great pool. 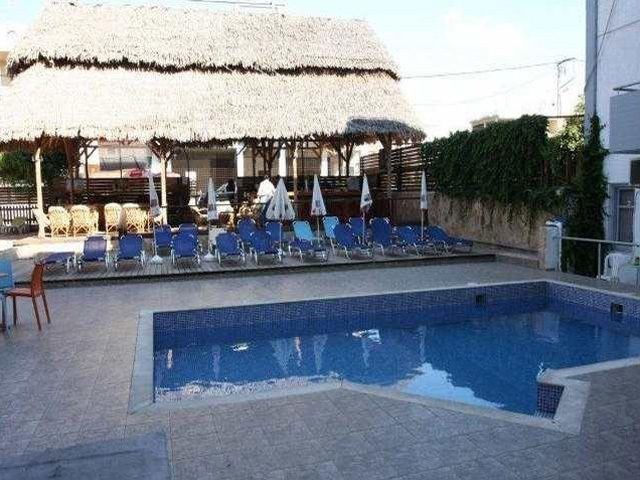 The huge, tropical pool bar is a great place to start the night before heading off into the Hersonissos nightlife. The beach is only a couple of minutes away so it's ideal for all you beach lovers! Hersonissos Blue Hotel provides budget accommodation close to the beach and lively nightlife, just 400 metres, with it's 24hr bars. The accommodation is clean and tidy and has all the facilities you will need to enjoy the sun, sea and sand just 50 metres away here on Crete. • Lunch (13.00-14.30)-Accompanied by Soft Drinks, local Beer, local Wine. • Dinner (18.30-20.30)-Accompanied by Soft Drinks, local Beer, local Wine. DRINKS IN MAIN BAR:11,00-22,00 Local alcoholic and non alcoholic drinks, local Beer, local Wine, soft drinks, filter coffee, tea, raki, locally produced Brandy and Ouzo.